49 Characters; only 13 actors required with doubling. 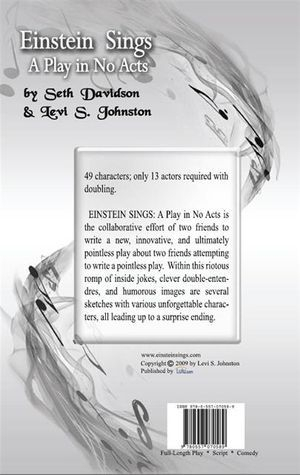 Einstein Sings: A Play in No Acts is the collaborative effort of two friends to write a new, innovative, and ultimately pointless play about two friends attempting to write a pointless play. Within this riotous romp of inside jokes, clever double-entendres, and humorous images are several sketches with various unforgettable characters, all leading up to a surprise ending. The cover design for Einstein Sings was creatively crafted by Mirona Jova.